Discussion in 'Fettling Forum' started by smojo, Nov 8, 2018. Hi guys. Bought this 1956 Monitor MOD stove at a junk shop for £5. I have limited experience with pressure stoves so asking a bit of advice please. Having looked at some photos I'd say it is missing the vapour cup spreader thingy off the top (sorry don't know it's proper title). Q2 - Can one be made and how and? Q5 - I have another small stove in it's original tin. The paintwork is very poor and dull and slightly rusty. To brighten it and preserve it from further deterioration can I give it a coat of something like a wax product? Thanks in anticipation of your answers. Hi @smojo there should be both an inner and outer burner caps on your Monitor stove. Many of these MoD stoves had a sprayed gold paint finish over a normal brass tank. You can see it in the 1953 Monitor link I provided above. I would go for original finish if it is not too damaged....save you a lot of time polishing the tank! Thats brilliant thanks. Mine is like the second link. The parts are cheap enough so just need to decide which size is suitable. Forgotten how to post actual image but here's a link. Ha done it but it's massive! A bit confused at how the inner and outer fit. The spares shown at parafinalia suggest mine is medium size. The dimensions quoted show the inner medium to be 6cm dia and the outer only 5.3 mm! There is a gap between inner and outer caps to promote mixing of the fuel vapour and air before it emerges from the multiple holes in the outer cap and is ignited. 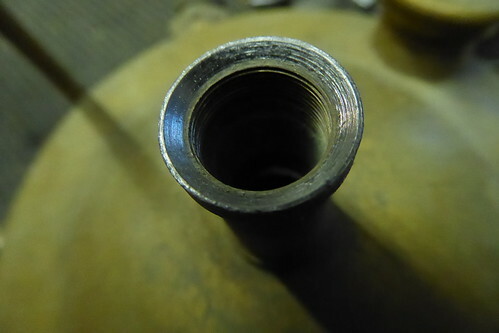 Looking at the top of the burner, the inner cap sits on the raised area, the vaporisation chamber, and the outer cap sits over the inner cap, just inboard of the multiple penetrations in the skirt of the burner. Outer Cap = 44.6mm OD, 47mm on bottom lip. Max. Height = 26mm. 4 Rows of holes. Thanks for the dims that's really helpful. Another question please. There's some kind of seal/washer between the top of the tank tube and the burner. Looking down inside the tube the top has a dished appearance and no seal in it. Looking at it's opposite part, the underside of the burner, there seems to be a very compressed washer/seal of some kind. Could be lead I'm not sure. I'm wanting to order a replacement and as far as I can tell from exploded views etc it's part no 2221 on the Base camp site but I want to order it on Fettlebox along with some other stuff. There's a full kit E but the seals in there don't look as though they include this one, not lead, some kind of fibre and as the faces of the components are not flat, I would imagine it needs to be lead. Can anyone say if they are the correct ones or not please. Will try to add photos now. Hi @smojo The burner washers would likely have been asbestos based composition originally, not lead. Damp down the residue of the seal or seals with water (there is likely one above, and one below the spirit-cup). Pick out the remains, seal them in a plastic bag and dispose of in domestic waste. You do sometimes see dished surfaces, but more often they are flat. The new style of asbestos-free, heat resistant burner washers should conform to the dish shape if it is not too extreme. Happy day today. 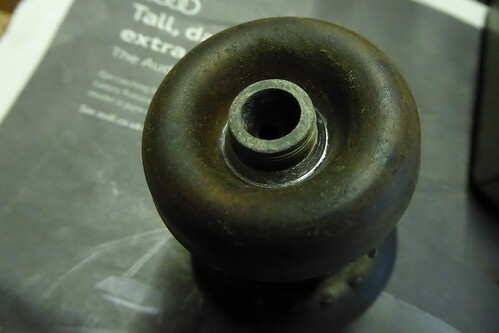 I made a new lead washer for the pump tube to tank seal which was leaking before. After checking various youtube vids I found that you need to let the meths burn right out with the silent burner, then light it manually from the top. A point worth noting for other newbie stove restorers. Last time I tried it, I was trying to let it self ignite like it does with the roarers but it was igniting under the ring, then cooling enough to stop vapourising and blowing liquid fuel out. So thanks again for all your advice folks, I am well pleased. I found the stove in an antique centre and bartered them down to £5. It was a gamble because I knew parts were missing (the inner and outer cups) but didn't know they were available, what size etc. Thanks to you guys I have spent about a fiver on spares and now have a functioning stove for about £10. Loving the fact that I have brought it back to life it will now live at my woods where I visit regularly and will be used in winter for many brews when butane stoves are useless. Hi @smojo. I am glad that you have your Monitor working well. To avoid under-burn you should never allow ignition of the flammable mixture under the outer cap. 1. Pre-heat the burner with absolutely no pressure in the tank. 2. Allow the pre-heat flame to totally extinguish. 3. Quickly close the air release, and pump the tank 10-15 pump strokes. 4. You should get clouds of white paraffin vapour/air mixture exit the many holes in the outer cap. 5. Only now should you light this mixture with a match or flame applied above the outer cap. 6. After 2-3 minutes of successful burn you can increase pressure gradually until full power is achieved. 7. If, on lighting, the burner immediately reverts to underburn, release tank pressure and start the whole process again.